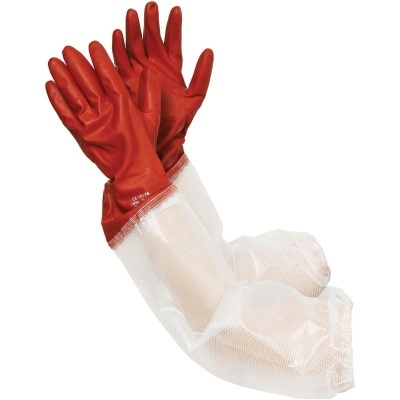 The Ejendals Tegera 8175 PVC Chemical Resistant Long Gloves are vinyl gauntlets that provide excellent splash resistance against chemicals for both your hands and arms. They are comfortable and flexible, ensuring you can easily use them for longer periods of time. With a diamond grip on the palms and fingers, these Long Gloves allow you to work securely as well as accurately. The 8175 PVC Chemical Resistant Gloves are designated Category III gloves, which means that they are designed to protect against the highest levels of risk, such as highly corrosive acids. These are gloves of complex design, suitable for irreversible or mortal risks. The Ejendals Tegera 8175 Gloves are available in five sizes that should suit the hands of most users. Please measure the circumference of your hand around the knuckles (excluding the thumb) with your hand open and your fingers together, and the length of your hand from the tip of your middle finger to your wrist.